On Saturday, 18 February, nearly 5000 people filed into the great hall of the Kremlin Theatre in order to attend the gala concert in honor of Andris Liepa's 55th anniversary. Film clips of Liepa's early years greeted the audience pre-curtain -- the "Ballet Russes" curtain -- referring to the Diaghilev works that Liepa has helped restore over the past few decades in various international theatres. Liepa himself came on stage to introduce each performance number. The evening, divided into two parts, featured both opera and ballet, with detailed explanations from Liepa about their relevance in his illustrious stage career. Act I featured Act 3 from the opera The Golden Cockerel, a work that Liepa set himself on the N. Sats Moscow State Academic Musical Theatre. Cockerel presents its dancing characters in the brightest reds and yellows while the singers themselves stand downstage in formal attire. Alexander Tsilinko, honoured artist of Ukraine, sang the role of Tsar Dodon (danced by Oleg Fomin) and Olesya Titenko sang the role of the Shemakhanskaya Tsaritsa (danced by the lovely Natalia Savelieva). The cockerel himself, Mikhail Galiev, a compact dancer, fluttered quickly across the stage in numerous airborne jumps. Liepa's reconstruction of Spectre de la Rose followed, featuring Yulia Makhalina and Xander Parish. 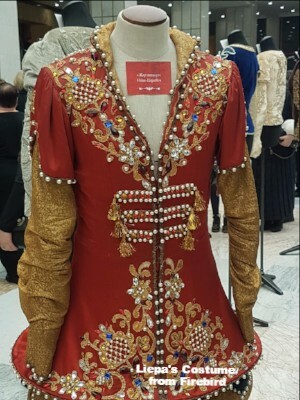 As Liepa's father had danced role of the Rose, the heritage of this ballet takes on particular importance, serving as an example of the care Liepa has taken to safeguard such balletic heirlooms. Mr. Parish, whose exquisite legs etch the unfurling beauty of a rose in bloom, embodied the essence of the role from the height of his jumps, to the beauty of his curled port de bras. Attentive partnering to Makhalina completed the historical display. This number was the first clear highlight of the evening. The dancers of the Sats Theatre then attackedPolovtsian Dances with electric energy, also reconstructed from Fokine's choreography by Liepa. Following a brief intermission, Liepa narrated a series of film clips from his early career, from his win at the Jackson Competition with Nina Ananiashvili, to his debut in Mikhail Baryshnikov'sSwan Lake at ABT in the '90s. From his debut inBayadere, to clips of Liepa in Ivan the Terrible and Grigorovich's Romeo and Juliet, his exquisite lines and heartfelt emotion in each role were palpable. Act II presented a series of nine divertissements. Most poignant was a short piece choreographed by Ekaterina Semyonova-Neyman representing Ilze Liepa's Russian National Ballet School, in which two youngs dancers, Arina Vasiukova and Denis Chetverikov, each not more than 4 years old, danced an adorable pas de deux. Ekaterina Borchenko from the Mikhailovsky then joined Evgeny Ivanchenko from the Mariinsky in the Black Swan pas de deux, both providing a solid, if cool rendition of the famous duet. It was perhaps the rising star of the Bolshoi, Alyona Kovalyeva, who joined Yakopo Tissi in Grigorovich's choreography for Raymonda, that stole the evening in the second act. Kovalyeva, who graduated in June 2016 from the Vaganova Academy, immediately joined the Bolshoi and in her very first season was given the leading role in Diamonds - an almost unheard of honour at an institution where many may take years to climb the ranks. Impossibly tall -- she is over 5'9"- with limbs and feet that rival Svetlana Zakharova, Kovalyeva has a beautiful face and lovely delivery. The Glazunov score proved a celebratory romp for the pair who brought both technical purity and sparkle to the dance. A surprising gift came in the form of Tatiana Melnik, a soloist with the Hungarian State Opera Ballet, who reprised the Grand Pas de Deux from Don Quixote alongside Vadim Muntagirov from the Royal Ballet. Muntagirov, clean and crisp in his delivery and ever-reliable in the duet sections, is always a pleasure to watch, but it was Melnik, a compact, smiling beauty with both limbs and nerves of steel, who executed with utter bravura and strength, so much so that that one longs to see her in other roles. The only slight disappointment in the evening was that the Bolshoi Theatre itself could not have hosted an evening honouring Andris Liepa. One presumes with the recent constant shifts in the administration, it might have not been politically desirable to focus on such a benefice as was the style in the 1960s and 70s for retired or retiring artists. But we still hold hope that we might witness, perhaps, his 75th anniversary on stage at the Bolshoi.